Yet another day under the light of the Immortal Sun, and yet more spoilers as we hit the halfway mark of what's been revealed. All the Elder Dinosaurs have awaken, a Red Sun rises over the jungle, and our close tutelage has been a wish granted. Someone dressed this kill spell as a Pirate. Seriously, it's good on attacks and blocks. Very versatile. 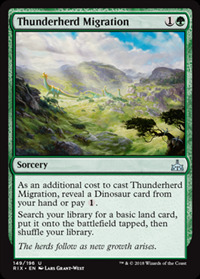 Though obviously intended for dinosaur decks, having access to Rampant Growth in a deck like that is something Dinosaurs can do for variety. It may become their bread-n-butter spell akin to Energy's Attune With Aether. Tightrope. 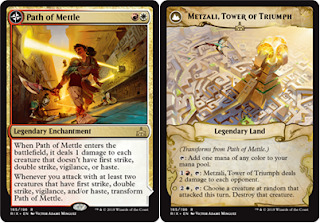 This up there with the Black/White flip card of the set (not covered by me because I find quite weak in power) to be quite puzzling in terms of play-ability. 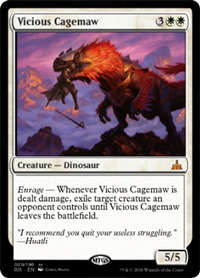 The front-face is designed as a token sweeper and also an Enrage enabler - that's okay. The Land face interests me. Never do we see a White activated ability with the words 'At Random' in it. Typical of a Boros colour card. 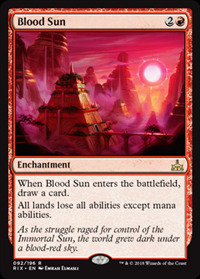 While this is no Sunhome as it's simply not intended that way, it is instead a supplement to help a Red/White aggro deck have reach damage and not die on back-swings. Interesting. I call him Lockjaw, just like the pet puppy of the Inhumans who's bite is at least as strong as The Hulk. It's clear that White will be using O-Ring style removal for the rest of time. This is just an intimidating force with a repeatable O-Ring on it. Let's hope it doesn't get eaten by a Chupacabra. Two WELCOME reprints here. 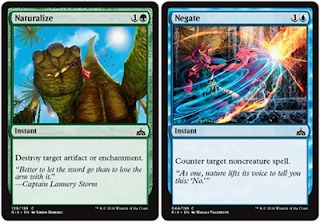 With Negate here in Rivals, we're guaranteed it'll survive Rotation. 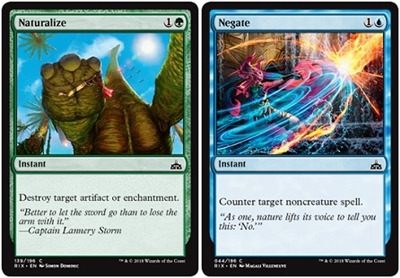 Personally, I feel that it should be one of those cards that should always in Standard - up there perfectly with Lightning Strike in Red and this in Green. 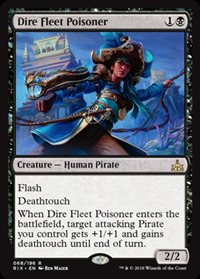 It's obvious they've reprinted it so it can have Sideboard play against White Enchantment based removal like Cast Out, Ixalan's Binding, the new Baffling End, and the Flip Cards. It will see play for that very reason. This is one of the strongest low cost Wraths I've ever seen. In the current Standard, this leaves behind a fresh Bristling Hydra or Glorybringer, Whirler Virtuoso and two of its Thopters, and a few other things. Otherwise that's it. It even makes Red sacrifice Hazoret. If this doesn't push Blue/White Control for Standard play, I don't know what will. This is not the Control finisher I was looking for. Can't be countered 7/7 that draws a bunch of cards and lets you keep them is very nice, but the trigger comes from Opponent's Noncreature Spells. Also the dodger ability is mostly good against removal. 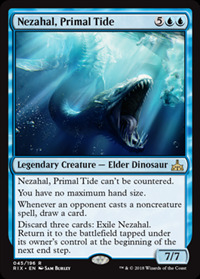 To me, Nezahal works better as an anti-control threat and i do hope Zetalpa is up for the challenge. 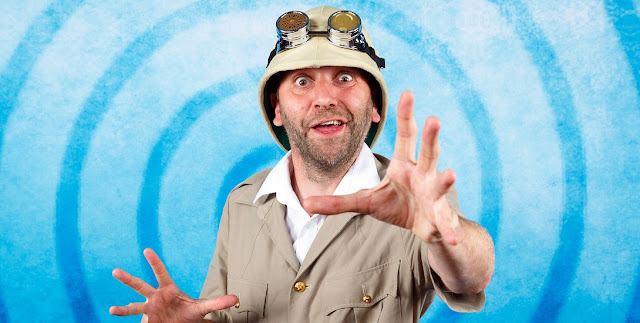 See Wedge from the Mana Source discuss the big fish here. Well this is certainly not what anyone was expecting. 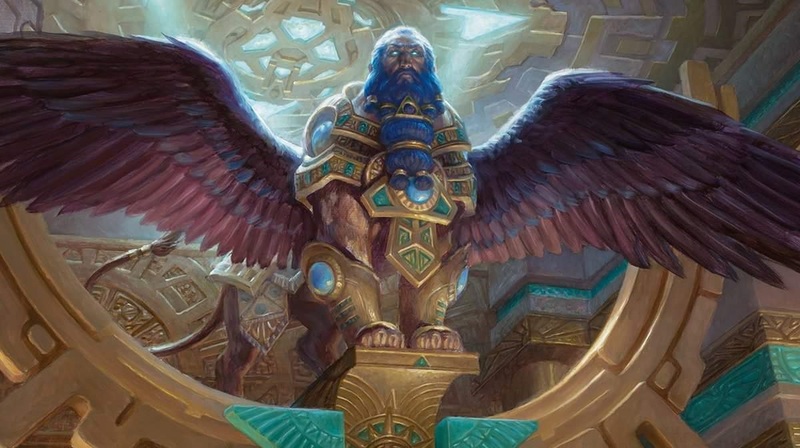 There's been a few surprise cards in this set - and there's another one coming in this article. I digress, back to TutorWish as I call it. It's four mana to have access to anything in the entire 75. It can involve you building a toolbox control deck with this and Flood of Recollection to have eight copies of this effect. My question is, will this actually do anything? I sincerely hope so. Dev from Strictly Better Magic the Gathering seems to like it. Well. Okay. The question on everyone's lips is: "is this better than Blood Moon?" I truly cannot say. The fact it cantrips is a step towards greatness. Taking away non-mana abilities is much kinder than Blood Moon, but I don't know if kindness makes you as key a sideboard card in the game of Magic. In Standard, it's a slam dunk, must have Sideboard card. Turns off the flip lands, turns off Ramunap Ruins and other deserts. In Modern, it turns off Fetch Lands, and it turns off Man-Lands like Celestial Colonnade, it does not turn off Tron Lands like Blood Moon does. In Legacy, it turns off Dark Depths and Thespian Stage, but does not turn off Duals. I don't know, but I'm interested to test it. 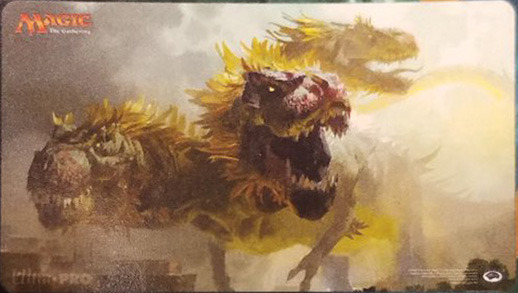 Now when I saw the art for this big boy, I thought one thought: "does he have triple strike like this guy?" Sadly no, but three other great keywords, a mad cast trigger, and three activated abilities to make most Commander players feel intimidated. It's worth mentioning that he has to resolve before you get to untap all your land, it's not like one of those non-interactive Eldrazi triggers. R&D have learned their lesson. The payoff of basically paying no mana for this guy seems great. The activated abilities are all relevant in a big EDH game. Popping X/3's is usually always good. Popping Artifacts and Enchantments is always good in Commander. There are ways to bounce and recast this boy for infinite mana and infinte life (which is fine for you, because who wants to attack into your Vigilant 9/9?) 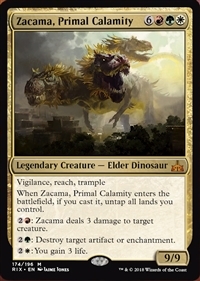 Dinosaur tribal, stompy, something combo-ey; I can see Zacama being the apex predator at a lot of Commander tables for a very long time. 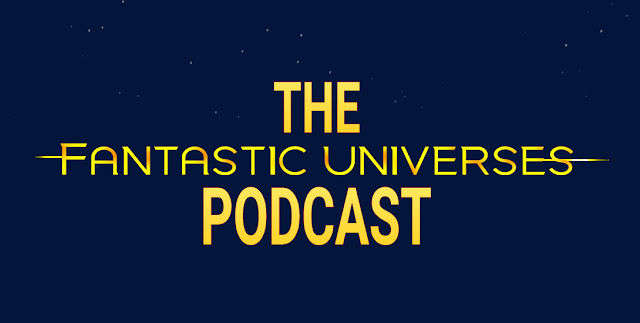 Check out Jimmy and Josh talk about their friend's take on a potential Commander deck built around Zacama here on their podcast. I do believe that this is the end of individual spoilers. 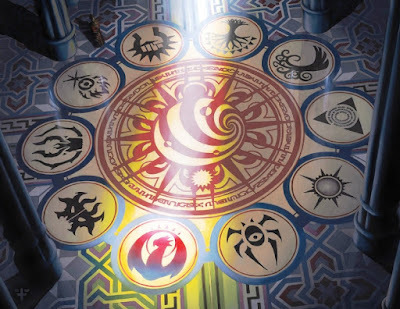 Wizards usually does the full set reveal on the Friday a week before Pre-release; tomorrow as of when I write and publish this article. Expect a follow up in response to the set dropping, what I'm up to in New Standard, and how new Standard looks with Rivals of Ixalan. Tune in to twitch tomorrow to see LoadingReadyRun play their traditional Pre-Prerelease of the set, and thanks for letting me ramble my opinions of cards.